I got to know about the Pune Goa Ultra cycling race called the Deccan Cliffhanger, which also happens to be a Race Across America (RAAM) qualifier sometime late in June 2018. As soon as I heard about it I was possessed by the idea of participating. After a chain of injuries, I realized that such races need an immense amount of training. Life had different plans and sometime late in September, Dr. Dhanraj called me as asked me if I would be ready to support them as a crew. I jumped on the idea without batting an eyelid. Another call a few days later as I was requested to captain the crew team. I had my apprehensions as I had no prior crewing experience, but the faith shown by the riding team ensured that I agreed. I was supposed to crew for a relay team of 3 men, Sunil Patil (Sidhu), Dr. Prakash Thombre and Dr. Vishwas Takale. Team PVS Pedal Demons. 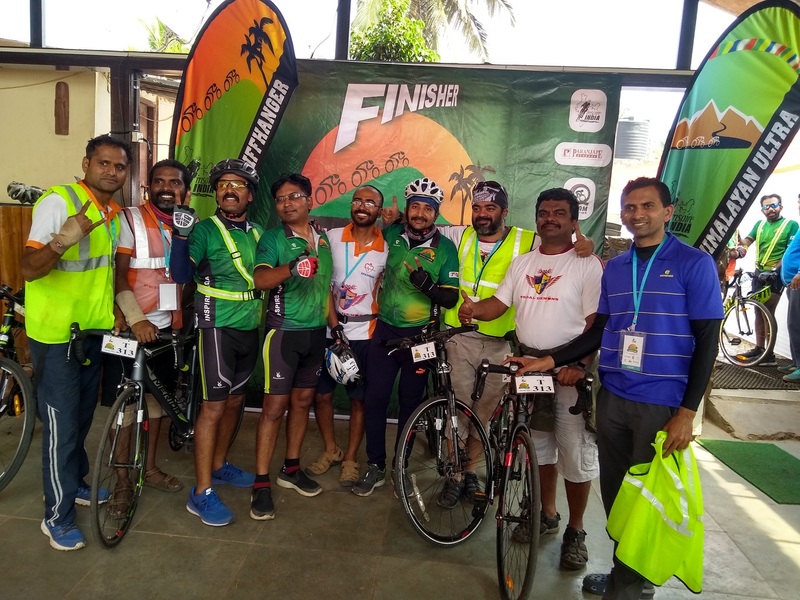 This blog is about the race journey and how we a team of complete rookie’s managed to bag the second place in our category at the Deccan Cliffhanger 6. The team did multiple training rides. We did a few crew supported rides, both day and night rides. We also did a few unsupported long rides. After the race route was declared, we also drove to Goa via Chorla ghat to check the road and also navigation in Belgaum and Goa. The details of such experience would itself be a blog, hence I would skip these details and directly jump onto the Deccan cliffhanger race day details. The ride was supposed to be flagged off in 3 phases from the Cliff at Bhugaon. Ours being a team of three was slated 10th in the 7:45 am a slot. Reporting time was set for 7 am. I woke up at 3:45 am with a target to pick up Sidhu, Rao, and Anoop on the way and reach Vishwas sir’s house at 5:15 am. After picking these gentlemen we stopped for some Poha breakfast and some tea on the way. Reached Vishwas sir’s house at 5:30 and were followed by Prakash sir. As we were checking the bikes and the luggage, Prakash sir dropped a bomb that his car had a flat. We quickly got to work and managed to change the tyre in 10 minutes flat. The next issue was that one of the bikes were not fitting onto racks as we had changed the rack. The crew got to work and we distributed the task of checking the bikes and air pressure and some spent time fixing the cycle on the rack. We were a team of 3 riders and 6 crew members. Three crew were present at the start point, the other three were to join us on the way. Ashish Phadnis (Driver), Anoop (Driver), Kushal Deshmukh in car two which was a swift Dezire. We all crew and riders met at Chandani chowk, and let the Dezire go-ahead ahead to the Cliff for the flag off. While we decided to get the tyre fixed for the Dezire. The puncture repair guy took advantage of a small commotion created by a jittery Sidhu losing his phone and punched three holes. We were made party to a puncture scam early in the morning. I was left fuming but controlled my emotions and we headed to station ourselves in front of the gate of Forest Trails. Sidhu had created a brilliant rider changeover plan and we had decided to strictly follow it. Prakash sir started the ride and Sidhu was to take over half way up at the Katraj climb. We picked up breakfast and lunch on the way (we had ordered food from a caterer) and stationed ourselves at the changeover point. Our changeover plan was divided into 15-21 km sections and we were alternating the follow cars and the change over cars. Rao was the heart of managing rider nutrition and hydration in my vehicle. He was also taking care of the rider transitions and communications. I and Dr. Ajay were assisting in bike loading and rider transitions. I was also ensuring that each rider would perform a 3-minute dynamic warm up. Sidhu and Dr. Prakash were responsible to tackle most of the climb sections and Dr. Vishwas was tackling the rolling sections. During this phase, we dug into the breakfast packs and realized we only had Shira and no Poha as discussed earlier. We tackled Kambhakti quickly and reached Surur, at Wai Phata. The Surur Panchgani Bhillar Medha Satara section had rules which allowed only one support vehicle, whereas the section from Panchgani to Bhillar from 110-117 km barred any rider transition. At Surur, we stopped for rider transition, as well as switched a crew. None of us had any experience of the Bhillar Section, the only crew who had an idea was Ashish as he had crewed the year earlier for another team. At Surur Sidhu went slightly ahead, thinking there was a CP. However, unlike the year-earlier there was no CP’s this time and it took us a bit of time to calm him down and explain that the only CP was at Panchagani at km 110. We started from Surur with all three riders and three crew members, including me at the wheels. Sidhu had decided to use the same bike as Dr. Vishwas as we were carrying an extra flat bar road bike with disc brakes for the descent. We did 4 km transitions on the Pasarni ghat. By now the temperatures were soaring and the heat was the biggest challenge. Sidhu started slightly struggling on the climb as he realized that the seat height was not ideal for him on Vishwas sir’s bike. Dr. Prakash was performing really well on the climb. Post Harissions Folly our plan was that Dr. Vishwas would tackle the rolling terrain, then DR. Prakash would handle the no transition Bhillar Section and then Sidhu would tackle the steep gradients and the decline with Dr. Prakash. Soon after we transitioned to Dr. Vishwas, we noticed a lot of traffic. Thought of handing a phone to Dr. Vishwas, but with his cyclocross bike, he soon charged ahead. We were sitting ducks in the traffic jam and I started getting anxious with every passing minute. Spending close to 30 minutes in the jam and we saw many riders overtake us. We made a dash to the CP at Mala’s past Panchgani city and I was driving like a maverick but with a check on safety. We reached the CP with no sight of Dr. Vishwas. The CP officials told us that our rider had just left 5 minutes back. We were hoping that Dr. Vishwas would stop at the CP as we had planned a rider transition at that point. We were worried if Dr. Vishwas had gone the wrong way to Mahableshwar. Our earlier practice ride was on the Mahabaleshwar Medha section and we had not done the Bhillar patch. We drove on and just could not see Dr. Vishwas on the road. Growing anxious we started planning to head back and drive towards Mahableshwar to look for Dr. Vishwas. Looking at the inclines we were getting more and more worried. The roads were also unmarked and sans navigation, one would definitely get lost. At around 114 km mark we spotted Dr. Vishwas navigating a treacherous climb. We were both happy and tensed. Happy because we had our rider and team on course, and tensed because Dr. Vishwas was on the road since a few extra kilometers than planned and was definitely not prepared to handle the inclines. The ‘no transition’ rule meant that we could do nothing for the next three km at least. But the way Dr. Vishwas was riding, he surely had won our hearts. He went ‘all in’ ( a term we use in poker games). We quickly had a chat with him, a few words of encouragement and we stationed ourselves at 118 km mark for a changeover to Dr. Prakash. The road past the 118 mark was beautiful and challenging. The views and the inclines. I made a mental note to cycle on this route soon. We affected a couple of changeovers between Dr. Prakash and Sidhu, with Sidhu tackling the decent on his flat bar road bike with disc brakes. We had to go down the decent very carefully and slow as the road was bad in patches. Safety of the rider was of prime importance and I was horns blazing to warn the rider of steep turns. Dr. Prakash and Sidhu gobbled the climbs at ease. Finally getting off the Driving Duty and also getting some rest- Or did I? Once on the flats, we heaved a sigh of relief. We affected a changeover at 155 km mark or so and crossed Team Adesh. Sidhu ran alongside Dr. Adesh to spray cold water to cool him down. We decided to change the driver duties and Dr. Ajay was back in our car. Fished out the lunch boxes and realized that the lunch ( Paneer Pulav) was getting spoilt in the heat. We realized that had poha neatly hidden in the bags, so we had Poha and the Paneer pieces. We negated the traffic of Satara and once we hit the straight highway again, I handed over the car to Dr. Ajay. Once back on the road, Dr. Vishwas complained that his legs were shivering and he was not being able to deliver any power. I asked him when was the last time he peed and his answer was ‘in the morning’. Putting two and two together, I asked Rao to put Dr. Vishwas on a bottle of ORS and also asked him to finish a liter of water in the next 30 minutes. Decided to rest him for a while and allow him to recover. Sidhu and Dr. Prakash did the riding duties for the next 1.5 hours and Dr. Vishwas got some well-deserved sleep. Looking at the extreme heat, we decided to change the riders every 8-9 kms instead of the planned 15-20 kms. These quick changeovers meant that both the crew teams had to be on their toes. The transitions were quick and the rides were small. No one from the crew team was going to get a breather. In all of this, we also had a small mayhem situation. Right after Satara, Sidhu had cycled some 100 m away from the car. I went to pick up his bike and was waiting for Dr. Ajay and team to get the car near us so that we could load the cycle and move ahead. However, the car was not moving. Rao signaled me to come to the car. I ran back to realize that the car was refusing to crank. Both of us pushed the car along with another stranger who joined us and got a jump start. Right, that moment we decided not to turn the engine down again. We hit Kini toll plaza roughly around 6 pm, the start of nighttime rules. From 6 pm to 7 am, all riders were to strictly ride within their follow vehicles headlight. Which meant that one vehicle had to follow the rider at all times. The traffic leading to Kolhapur was thick and we were very worried about our riders safety. We deviated from our preplanned changeover plan and decided to rotate the riders as per the terrain. The changeovers were short, 6-8 km. When we were not following the rider, we could quickly go ahead, analyze the terrain and decide to call a changeover. This meant that the Tavandi ghat road climb ended up being handed over to Dr. Prakash instead of Sidhu. He really wanted to tackle that climb, however for me changing a rider for a 2 km short climb did not make sense and I requested Dr. Prakash to complete the climb who did it with ease. We could throw anything at Dr. Prakash and he would deliver on it. Post Kolhapur I was back to driving duty as I felt Dr. Ajay was showing signs of fatigue. We were running low on water and the route post Tavandi had little or no amenities. We decided to pick up enough water stock for the night, a few cans of red bull for the drivers and riders. Kushal picked up some dal khichadi and Sidhu had managed to get us 24 boiled eggs on the way. We were at Tavandi by 8:30 pm and doing very well for a 24-25 hour finish. We had managed 329 km in less than 12.5 hours and reached CP 3. Both the cars and riders stopped for 10 minutes and grabbed a cuppa. While Rao decided to unload the thrash and reorganize the car. I decided to join and help him a bit. The poor fellow had been treating us like his children. He had single-handedly managed the food and hydration for the crew as well as the riders and also the communication. While we waited, the backup vehicle started off with Sidhu, we joined them soon and restarted ours on the fly changeovers. During each toll our strategy was simple, one car would move ahead and halt post the toll gate, the other car would deliver the rider at the toll and the first car would continue to follow so that the rider is always riding within the car headlights. Next target was to reach U-turn point at Belur, manner CP at 448 km. With rolling terrain, we were quickly gobbling up kilometers. Sidhu did complain of pain in his hamstrings after one section of climbs. I gave him stretches and some massage. Rao joined in to give him some massage too. We decided to give him a bit of rest and planned to have him take over the riding from Belur CP. The Dezire reached the CP and prepared for the transition while we followed the rider. We reached the CP and quickly got the card signed and started back with Sidhu. 448 kms done at 01:14 am. We were bang on target, averaging 26 kmph. Less than 200 kms to go and roughly 7 hours to achieve that. Casualty part 2. Sidhu down with a hamstring pull. We started back from the CP and faced a bit of traffic from other riders. The tandem team had 4 vehicles following and were making following our rider difficult. We were in awe of the speed the tandem team was managing. Sidhu managed to gain some speed and we moved ahead. We asked the Dezire to go ahead and prepare for the transition however 4-5 km into the ride, Sidhu sat down on the roadside. The pain in his hamstring was immense. Sidhu was not used to such extended sprints and this started showing up. With the other vehicle way ahead, we decided to transition to Dr. Prakash and asked the Dezire to move slightly ahead. The section post-Tanavdi was a very difficult one as the phone networks all seemed to have ditched us. Communication between the two vehicles was completely broken and things were completely out of sync. As we were not following any plan and taking decisions on the go, the communication between the cars was super important. We decided to give Sidhu some rest and he, in turn, fell asleep pretty soon. This was also the phase when I was the most tired and sleepy. I tried to catch some sleep during the transition times but was not getting any, just had a few eye shut moments. During one such transition I finally managed to grab 5 minutes of sleep but was rudely woken up by noises. Realized, that only Rao was on the road waiting for the rider to arrive, the other crew team could not communicate their arrival time as they had no mobile network. We quickly got the rider ready and sent them packing. There was a good incline post the Hirebagewadi toll. While coming down we had no idea on how difficult the incline was, nor the distance. Sidhu was supposed to tackle the climb but was now down, and we were not sure if he would be able to ride again. It so happened that Dr. Vishwas ended up getting that climb. Once we started, we realized that the climb was long enough and was fairly steep. From the bottom, I could see the lights of other cars coming from the top and my heart almost stopped. We tried to get the Dezire to a position halfway up the climb for a transition, but because of the mobile connectivity issues, we just could not communicate and they went slightly ahead. Dr. Vishwas, on the other hand, pulled a rabbit out of the hat and put in 200% into the climb. He was struggling, and we were cheering him from the vehicle, Rao, Dr. Navale, and I. Dr. Vishwas finally managed to complete the climb and that was the defining moment for me in the race. As we were nearing the CP at Belgaum, we were facing a new and bigger challenge. We did not find any fuel bunk post-Belgaum to Belur and on return. We hit Belgaum Cp and were confident that the Reliance pump right beside the CP would be open. However as luck would have it, it was shut. The Duster had enough fuel to reach Goa, but the Dezire was running low. It was the decision to delay the fuel stop, however, post Tavandi I had instructed the Dezire to refuel, alas that was not the case. We reached the CP at 4:07 am 505 km. Picked up a cuppa and some sandwich. Upon inquiring we got to know that there was a fuel bunk on the highway, 5 kms from the CP. We had the choice to have the Duster follow and the Dezire to join in. I decided to give everyone a break. Sidhu got some stretches, tea, and some ointment. As the CP was flowing with riders, crew, and officials I thought this would be a refreshing break for all. The Dezire with Ashish and Kaushal, and the Duster with me and Dr. Ajay raced to the fuel bunk and refueled. This whole ordeal cost us precious 30 minutes and we restarted with Dr. Vishwas on the ride duty at 4:45 am with the biggest challenge of Chorla. At 513 km mark, we transitioned to Sidhu as I wanted to check if he could ride at all. He started riding and within 5 minutes gave us a thumbs up. I heaved a sigh of relief. I knew Chorla had decent elevations. What I did not realize during the fast route recce drive last weekend was how difficult. Once we started we realized that the climbs and inclines were not going to be easy. It was dark and cold. We decided to make fairly quick transitions in 3-4 km or 5-6 km. Our strategy on Chorla was simple, we knew there was no mobile network and hence no communication was possible. The duster was to follow the rider and the Dezire was to follow behind the Duster. We would analyze the rider and take a call on transition and accordingly move ahead. By now we were playing tic tac toe with team 312 our direct competitors. I was not paying any attention to them as with a couple of incidences with our riders, all I was focusing on was to have them complete the race and be safe. Somewhere right before the descent of the Chorla section is the lone hotel named Delta. I decided that it would be a good idea to get the team to take a 5-minute break and grab some warm tea. It was cold outside and the riders had really fought it out over the night. It was roughly 6:30 am. I stopped the car and went ahead to order tea for everyone to save some time. Right as I returned, the Dezire pulled up behind us with the Dr. Vishwas. Ashish and the rest of the team yelled at me for being stupid enough to take a break now. Team 312 was close on our heals and we had a good shot at getting the second place if we could beat them. Sidhu saddled up on his flatbar roadie and left. I still decided to grab my own cuppa, desperately needed something warm and something to eat. I fished in the car to find some Chicken Biryani which Sidhu had picked up from Belgaum. Quickly wolfed down half the biryani and a cup of tea while Dr. Vishwas, Dr. Ajay, and Rao got a cup of tea. 5 minutes later we were riding breakneck to locate Sidhu. We found Sidhu and relived the Dezire to move ahead. The rest of the 31 km decline was to be tackled by Sidhu. The apparent decline post Delta was filled with small difficult climbs and I started to notice that Sidhu was struggling again. Sidhu wanted a video of him going down the ghat and Rao was handed the duty to get a video. I noticed him spray out some kind of liquid from his mouth while riding. I asked people in my car as to what he was throwing up. Everyone was tired enough to dismiss that he might have taken water in his mouth and was just spitting that out. Half way down the road, Sidhu started complaining of pain in his arms. The roads were bad and the constant use of brakes was taking a toll. We quickly found a safe spot to stop and gave him a bit of massage. We enquired if we should change the rider and had the option of getting Dr. Vishwas on the road. Sidhu refused this and said he was fine. We started again and descended the ghat with extreme caution. We entered Goa and made a dash for CP6 at 590 km. The riders were exhausted and we decided to implement a 4-5 km rider changeover. We moved a few kms ahead and received a call from Kushal, that we should ride with two riders and rest Sidhu. Apparently what I noticed during the Chorla decent was actually Sidhu throwing up. He had vomited thrice during the last 30 odd kilometers. The injury in the night had meant that Sidhu slept in the night and did not eat much, combined with the fact that he was riding all out meant that he was working in zone 4 and 5. Lactate had built up enough in his body and he was suffering from hyperacidity. We reached CP6, 590 km at 8:37 am. The narrow roads of Goa were not aiding our quick transition plan and the last 55 km was going to be a challenge. Especially in the heat and humidity of Goa. Sidhu requested for some ice cream to calm his acidity and we started hunting for ice cream. Team 312 was constantly overtaking us and being overtaken by us. We realized that their support vehicle had met with an accident and their cycles were damaged beyond riding. T 312 was reduced to a two people team and the two riders were sharing just one cycle. They were being a true sport and really giving it all. (Salute to your spirit T312). We found ice cream at a small shop, Kushal ran to the shop grabbed the ice cream and joined the Dezire. Dezire started to follow Dr. Prakash while we waited for Dr. Ajay to make the payments etc. As we were waiting we received a call from Ashish if we had seen Kushal’s phone. Apparently, Kushal had lost his phone but was unsure where he dropped it. We could not see his phone at the shop counter so we started back. 2 kms on the road and we see Kushal sprinting towards us (He is a runner). We picked him up and decided to make a U-turn and head back to the shop to check for the Phone. Apparently, he had dropped the phone on the road, and we could not notice the phone on the dirt. We got back in the car and headed back to figure out where our rider was. Ashish informed that Sidhu felt better after the ice cream and was back on the road. By the time we located the team, Sidhu was tackling a climb. The traffic jam prevented us from reaching them and getting changeover to Dr. Vishwas. I was cursing the traffic. Sidhu was definitely not in the health condition and was struggling, but was just not ready to give up. We somehow managed to reach the top of the climb before Sidhu, and I forced him to get into the car. There was no way I was allowing him to continue even a meter in that condition. We were down to changing riders every 3- 4 kms. It was a race against T312, something which I was strictly against. I wanted the riders to be safe and sans any injuries. All the three riders were performing to their maximum. I read the map wrong at a junction, even that I knew the road, I made a mistake and sent Sidhu down a wrong route (Sidhu of all people at this stage). Sidhu found a nice decline and took off by the time I confirmed my mistake. I went horns blazing to alert him, however, he thought I was trying to clear the traffic for him and kept on going. We managed to somehow get to him and made him turn back. We saw 3-4 crew vehicles and riders follow us down the wrong way, including our own Dezire. Sidhu was now riding Prakash Sir’s Reacto and we had two riders in our car. This meant less load on the transitions however this also meant the riders would come to a standstill at some transitions. As we were nearing the last few kilometers, we started discussing if all the riders wanted to ride the last patch together. However, it was finally decided that Dr. Vishwas would ride the last 4 kms primarily because he absolutely knew the last patch. He had recently spent Diwali vacation on this beach. Dr. Prakash was the one who had no idea of the roads and needed navigation. He was the only rider missing from the route recce as he was the iron man event at Kolhapur the other weekend. There is an extremely challenging climb just before the route hits the four-lane Airport road highway. Sidhu was on that patch and we asked him to just walk the climb. Riding that climb was not worth it and he readily obliged. Team 312 crossed us here. We managed to get back in the lead again with some heroic riding by Dr. Prakash. He was managing some cool sprints in the end after being slightly fatigued the night before. Just before the turn off the highway towards Bogmalo Beach, there were a couple of signals. Our team got stuck and T 312 caught up. Dr Prakash was heartbroken. We made the final changeover just before the turn to the beach and got our trump card, Dr. Vishwas. After we loaded the bike and moved ahead, we received a call from the Dezire that we must change the rider as Dr. Vishwas was struggling to keep up with the climbs and hold his pace for 4 kms. Rao suddenly remembered that T312 had a 15-minute penalty earlier in the morning. T312 made a wrong turn just at the final corner and we made it before them. We later realized that T 312 had over 60 minutes in total penalties and we had zero, which means that we beat them by over an hour, but I salute their riding spirit and grit and determination. We rather had a very emotional end to the race. Our timing read 27:07:42 for the race course of 645 km. Our team of first timer participants at DC and an absolutely rookie crew had managed to pull off a podium finish with zero penalties and all safe riders. Team PVS – Pedal Demons had Conquered Deccan Cliffhanger 6 in style. I was absolutely dizzy by the end of it. Less than 10 minutes of sleep over 31 hours. 550 kms drive and a sea of emotions. But extremely happy for the team. PS: Sidhu had to be eventually admitted to the hospital for a few hours and was discharged and joined back the team later at the dinner party. An entrepreneur who suffered from major health issues at the age of 30. High BP, cholesterol on the higher side, obesity and chronic acidity. I suffer from back pain with fused vertebrae and have an ACL reconstruction surgery done for one of my knees. I am an rookie cyclist and fitness enthusiast. I have lost 27 kgs in 6 months. I love cycling and hope to participate in endurance races soon. Nice experience to read and feel the spirit. Why should you invest in a fitness band when you are trying to lose weight?